Even if I’d wanted to escape Jack’s voice once I’d finished Love That Dog, I couldn’t. Not only were his rhythms ingrained in my brain, but hundreds—maybe thousands—of readers wrote to me about this book, often in the voice of Jack. Most of the letters began, “Dear Miss Creech, you probably don’t want to hear from me . . .” just as Jack began his letter to his favorite poet, Walter Dean Myers. Nearly all of the letters were either written in verse form or included poems. So many of the letters asked if there would be a sequel to Love That Dog, and readers often suggested titles: Love That Gerbil and Love That Horse—oh, there were so many animals suggested, even Love That Worm and Love That Turtle. So, on a weekly basis, when the fan mail arrived, I’d hear Jack again, and it was nice. I like Jack. I thought I’d try to follow him into his next year of school, to see if he had changed, if he would grow as a writer, and to explore his relationship with another animal. A cat seemed a nice balance to the dog in Love That Dog, and “hate” seemed a nice balance to “love,” and thus: Hate That Cat. While Jack tells the story of one particular mean cat, he also lets us hear another story in his life: one of sound and silence. And just as Love That Dog touched on Jack’s relationship with his father, so this story touches on Jack’s relationship with his mother. 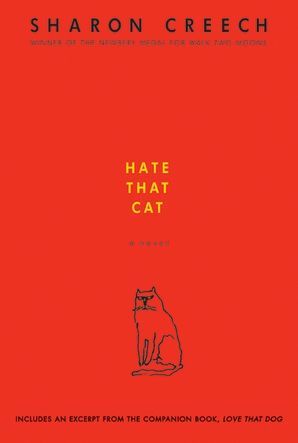 When I was midway through writing this story, I saw Walter Dean Myers at a readers’ theatre event, and he mentioned he had a cat. A cat! Walter Dean Myers is a very, very tall man. He looks like a pro basketball player. I didn’t expect him to have a wee little fragile cat. That makes its way into this story. Another discovery, when I was midway through writing this book, was the existence of a book called Black Cat. Not only was it a perfect book for Miss Stretchberry to introduce to her class, but also it was written by Walter Dean Myers’ son, Christopher Myers. Like Jack, I was beginning to feel as if the whole Myers family was in my brain.